Unless you are willing to completely rely on trial and error procedures, start your network design project by measuring the impedance of the drivers and correcting the impedance if necessary with a RC filter. How to measure the driver impedance curve ? It is very helpfull if you are able to measure the frequency response of the drivers to choose the best crossover frequency. How to measure the driver frequency response ? If you choose a crossover point in a range where the driver's frequency response is changing rapidly off-axis, the off-axis response will have large response anomalies. Large variations in the off-axis response degrade the power response the listener perceives. Reflected and reverberant response will be significantly different from the on-axis response, and generally devalue the overall quality. Selecting the best slope is important, both to protect the tweeter (in particular), and to ensure that the drivers are all operated within their optimum frequency and power handling ranges. A 6dB/octave (first-order) filter has the most predictable response, and is affected less by impedance variations than higher orders. On the negative side, the loudspeaker drivers will be producing sound at frequencies that are very likely outside their upper or lower limits. 12dB/octave (second-order) filters are better at keeping unwanted frequencies out of the individual speakers, but are more complex, and are affected by impedance variations to a much greater degree. The tolerance of the components used will also have a greater effect. The capacitance used must remain predictable and constant over time and power, which specifically excludes the use of bipolar electrolytics. A 18dB/octave (third-order) filter requires closer tolerances than a second order, and is again even more susceptible to any impedance variations than the 12dB filter. 24dB/octave (fourth-order) filters increases the complexity and tolerance requirements even further - a point must be reached where the requirements versus the complexity and sensitivity will balance out. For this example i use a second order (12dB) Highpass crossover network for 1 kHz. 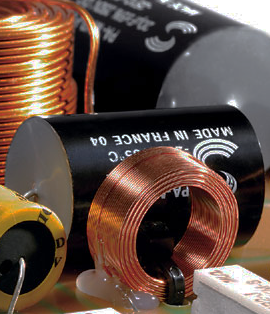 The capacitor and also the inductor both have a specific resistant at any frequency. At the crossover frequency (1 kHz) both components have the same resistanc (20 ohms). Now, the capacitor is in series with the driver and the inductor is parallel with the driver. The capacitor and the inductor together with driver are a voltage divider. And how much dB is that? Second-order Linkwitz-Riley crossovers (LR2) have a 12 dB/octave (40 dB/decade) slope. They can be realized by cascading two one-pole filters, or using a Sallen Key filter topology with a Q value of 0.5. There is a 180° phase difference between the lowpass and highpass output of the filter, which can be corrected by inverting one signal. In loudspeakers this is usually done by reversing the polarity of one driver if the crossover is passive. A Bessel filter is a type of linear filter with a maximally flat group delay (maximally linear phase response). Bessel filters are often used in audio crossover systems. Analog Bessel filters are characterized by almost constant group delay across the entire passband, thus preserving the wave shape of filtered signals in the passband. The Butterworth filter is a type of signal processing filter designed to have as flat a frequency response as possible in the passband. It is also referred to as a maximally flat magnitude filter. Chebyshev filters are classified by the amount of ripple in the passband, for example a 1 dB Chebyshev low-pass filter is one with a magnitude response ripple of 1 dB. Chebyshev filters are popular because they offer steeper roll-off rates than Butterworth filters for the same order, but for audio applications the Chebyshev is virtually never seen due to the superior magnitude and phase responses of the Butterworth class.